Oculus founder Palmer Luckey attended the Tokyo Game Show last week and was a featured guest speaker in a variety of panel discussions at the event, including HTC’s Vive stage where he broadly discussed topics on Japan’s growing VR scene and the future of virtual reality. 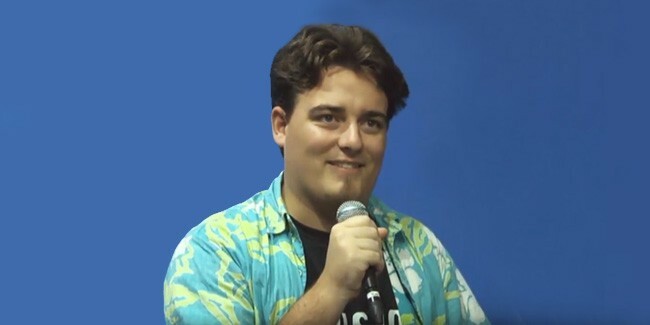 Although Luckey is no longer working at Oculus since his departure earlier this year, he showed during his appearance at TGS that he’s still enthusiastically passionate about VR and remains a supportive voice for the virtual reality industry as a whole and not particularly biased towards one company or platform. “Don’t think of me as an Oculus person,” said Luckey on the Vive stage at TGS. “Just think of me as a VR person. Everything. Sony, HTC, other companies – Everything,” he added, highlighting that he’s always been pretty supportive of all VR companies and has appreciated seeing other companies enter the VR marketplace and invest heavily into the ecosystem, funding developers, bringing awareness and pushing out hardware to consumers. In the past few months, there has been much speculation on what’s next for Luckey and what unique innovations he may be developing on behind the scenes. Luckey has occasionally hinted at some ideas that we could possibly see from him, such as his interest to create a game concept for VR that results in serious real-life consequences if you lose similar to the anime Sword Art Online, as reported by Road to VR. Luckey has also often suggested the idea that involves exploring the possibilities of virtual reality implant technology. This would essentially be a device that taps into the human nervous system in order to provide a sense of touch and allow the user to move around in a virtual world without physically moving in the real world. The implantation of experimental hardware is one of those extremely ambitious and somewhat controversial concepts that is likely not going to be consumer-ready anytime soon, but it’s a challenge that Luckey certainly seems willing to pursue to achieve this technological milestone. Finding doctors who are willing to implant experimental hardware is really, really hard. While virtual reality is still very much part of Luckey’s primary focus, it appears it’s not the only area of opportunity that he is looking into for future projects. Back in June, it was reported that one of Luckey’s other new ventures involves developing advanced surveillance technology that could potentially be used to create a “virtual border wall” for national defense and security purposes. It will be interesting to know when Luckey is ready to make an official announcement on one of his new upcoming projects, but until that time, we’ll just have to wait and see.